James Ward (1843-1925) was Professor of Mental Philosophy and Logic at the University of Cambridge. 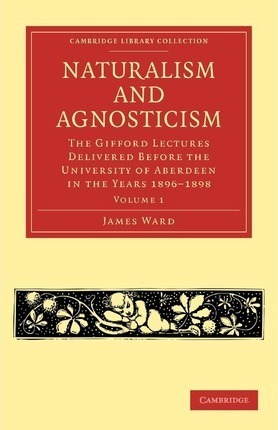 First published in 1899, this two-volume work consists of his Gifford Lectures, delivered between 1896 and 1898, in which he criticises Naturalism (the belief that all phenomena are governed by the laws of science, and that the supernatural cannot exist), and Agnosticism (the belief that the existence of spiritual phenomena cannot be proved or disproved), in favour of Idealism, in which spiritual and non-material phenomena are central to human experience. The lectures in Volume 1 set Naturalism and Agnosticism within the context of the Mechanical Theory, arguing against its claim that experience can be fully described in terms of mechanical concepts such as motion, energy and force. Exploring the ideas of prominent thinkers such as Newton, Huxley and Spencer, these thought-provoking discussions continue to inform and evoke debate among philosophers and natural scientists. Preface; 1. Introduction; Part I. The Mechanical Theory: 2. Abstract dynamics; 3. Relation of abstract dynamics to actual phenomena; 4. Molecular mechanics: its indirectness; 5. Molecular mechanics: ideals of matter; 6. The theory of energy; Part II. Theory of Evolution: 7. Mechanical evolution; 8. Mr. Spencer's interpretation of evolution; 9. Reflexions on Mr. Spencer's theory: his treatment of life and mind; 10. Biological evolution.